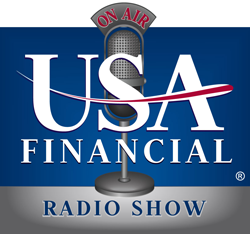 The USA Financial Radio show is all about the American consumer in retirement, or with retirement on their mind. The show is broadcast on stations all across the country. Our firm is proud to be one of the local sponsors of the show. Each week, the hosts discuss challenges that our clients face every day. Life insurance – when, where, and how? How to plan for inflation. The hosts of the show are key executives with USA Financial, a national leader in financial planning, investment management, and insurance services. The advisors affiliated with USA Financial are independent professionals from across the country – each of us owning and operating our own financial planning firm and working directly with our own clients, including listeners of the show! The USA Financial Radio show is strictly educational in nature and is not intended as personal financial advice. You should seek the help of a qualified financial professional regarding any strategies discussed on this show, as every investor’s situation is unique. Investing carries an inherent element of risk, including the potential for loss of principal and income. The hosts of the show are investment advisor representatives of and securities are offered through USA Financial Securities, Member FINRA/SIPC (www.FINRA.org) and a Registered Investment Advisor. 6020 E. Fulton St., Ada, MI 49301.